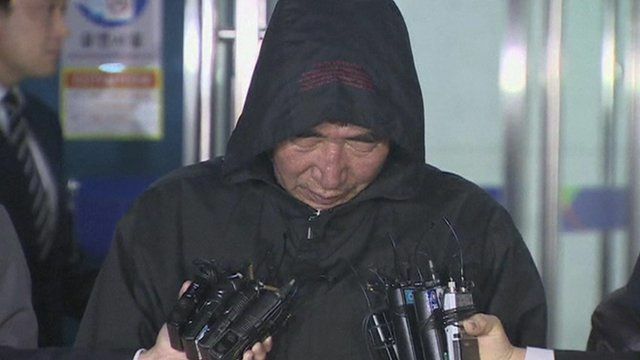 S Korea ferry captain: 'I am sorry' Jump to media player The captain of a South Korean ferry that capsized and sank this week has apologised to the families of the victims. S Korea ferry captain arrested Jump to media player The captain of a South Korean ferry that capsized and sank this week has been arrested. Was ferry cargo properly secured? Jump to media player A marine salvage consultant with more than 40 years' experience, has speculated on the theories that the ferry which sank off South Korea could have been off course or taken a sudden turn. Weather hampers ferry rescue effort Jump to media player The South Korean regional coastguard says that efforts to enter the sunken Sewol ferry have been frustrated by bad weather and obstructions in the cargo bay. Three bodies recovered from ferry Jump to media player At least three more bodies have been recovered from the ferry that capsized off South Korea after divers managed to access the vessel. Families wait at port for news Jump to media player Families are waiting anxiously at the small port of Paeng-Mok in Jindo for news about their missing relatives. The captain of the South Korean ferry, Sewol, that capsized and sank this week has apologised to the families of the victims. He was speaking outside Gwangju District Court, where he had appeared following his arrest. Amid suggestions he had delayed evacuation, Capt Lee Joon-seok, 69, said he had been worried that the water was cold and that there were no other boats around to help rescue passengers. He faces charges including negligence of duty and violation of maritime law.